Intro: Magnificent views surround you from Manta’s outdoor patio perched on the hill above Kauna’oa Bay. Laurence Rockefeller’s historic Mauna Kea Beach Resort offers the perfect Hawaiian setting to enjoy a leisurely Sunday Brunch. ThE hotel, built in 1966, was the most expensive hotel in the world at that time. Today, the history, charm and warm aloha vibe combine to make a visit here a special occasion. Understated elegance is coupled with a laid-back, friendly atmosphere so your senses are all massaged into ecstasy. To fully appreciate the setting, spend some time before or after your meal (walking off the meal may be a good idea!) to wander through the hotel and enjoy its amazing collection of artwork on display throughout the hotel. Location: Mauna Kea Beach Resort, 62-100 Mauna Kea Beach Drive, Kohala Coast, Hawaii. Menu: This Sunday Brunch menu offers a lavish buffet of traditional and Hawaiian-themed selections that flow through 3 entire rooms. Oh my, where to start? Breakfast foods include Hawaiian-style Belgian Waffles, fresh Island fruits and berries, Eggs Benedict, and made to order omelets. International visitors are treated to their favorites with a Sushi Bar, Steamed Dim Sum Basket with Sweet- Chili & Cilantro or Shoyu-Mustard Dipping Sauces, Sashimi with Shoyu & Wasabi, Shrimp and Vegetable Tempura and Steamed Rice. Hot and cold vegetables included Blue Cheese Potato au Gratin, Artichoke Hearts, Marinated Mushrooms and pasta salad. A custom Caesar Salad can be tossed and prepared just the way you want it. Entrees offered fresh fish: the Day Boat Catch, a carving station with Herb Crusted Prime Rib, or Grilled Herb Chicken, or the amazing Orchiette Pasta Mac and Cheese. Piles of fresh chilled Crab Legs and Shrimp Cocktail are constantly refilled. If lobster is to your liking, the Lobster Bisque with Black Truffles is outstanding. If you still have room, a whole room of desserts: pastries, cakes and pies of every kind and a build your own sundae bar will feed your sweet tooth. And there is lots more! Most beverages are included or you can indulge with Adult coffees and specialty Mimosas with Lilikoi, Guava, Pineapple, Orange or a Spiked Bloody Mary. Thoughts: Buffets are usually not my first choice because I usually leave feeling very stuffed and yet, thinking I should have eaten more. The Manta’s menu inspired me to resolve to take small tastes and start with what I really loved. The theme of relaxing and enjoying this meal was at the forefront. A warm sunny day offered the perfect climate to sit on the patio with the sounds of the waves crashing below. A lilikoi mimosa seemed at good way to begin. The local fruit lent just the right amount of sweetness to the Champagne. The aroma of fresh Kona coffee enticed my husband. Ah, the food: the lobster bisque was the place to start. It was, perhaps, the best I have ever had. The chunks of lobster were big, flavorful and plentiful. The spice-filled broth was not over powering and provided a perfect compliment to the sweet lobster. I could have had more and stopped with this and been a happy girl. But the piles of crab legs and shrimp were beckoning me. Cooked and chilled without being over-cooked, the delicate meats delighted with every, fresh bite. I skipped the waffles and the omelets bar, but watched others enjoy omelets with mushrooms, ham, onions, cheeses and herbs cooked to their pleasure. If breakfast is your thing, delectable choices include fresh pastries with pineapple and other island fruits, Eggs Benedict or maybe the Smoked Salmon with onions, capers and cream cheese. It was time for some healthy vegetable, so I opted for the custom Caesar Salad and loaded it with anchovies and croutons topped with a tangy dressing. Artichoke hearts and marinated mushrooms on a bed of fresh greens couldn’t be resisted. The herb crusted Prime Rib was served with two horseradish sauces as well as au jus. Rare and juicy, this Prime Rib was an example of the outstanding range free cattle the Big Island is know for. By now, the room full of desserts were calling my name. I skipped the macademia ice cream and loaded a plate with desserts. The pastries and cakes were cut into tiny squares, making it possible to try 6-8 different ones! Deliciousness in every bite! 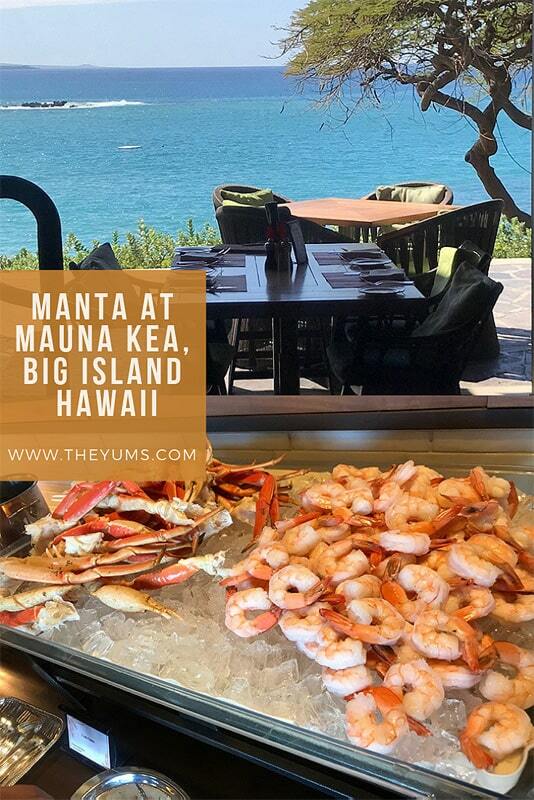 I’ve eaten at other buffets on my trips to the Big Island and the Mauna Kea is the best there is. You can also enjoy The Manta seven days a week for great breakfasts and dinners. Or just relax and watch the sunset, enjoying island cocktails or their extensive wine selection. Tuesdays and Fridays live music makes it even more fun. Price Range: $69 for adults and $30 for kids, all inclusive except for alcoholic drinks. Make a reservation, if possible, days in advance. The outside patio is the nicest seating but books up quickly.